Cheap flights from Italy to Buenos Aires, Argentina from €438 return! Great option for travelers in Italy to book greatly discounted return flights from many Italian cities to Buenos Aires, capital of Argentina. Based on promotion of AIr France-KLM (SkyTeam) can book cheap return flights already for €438 incl. all taxes and onboard meals. Checked bag for extra fee. 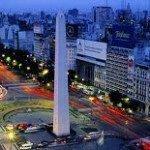 You will find the cheapest flights to Buenos Aires when departing from Rome, Milan, Venice. Turin, Bologna or Florence. At this moment great availability also at the end of local summer season. Flights have one short layover in Paris or Amsterdam on your way..Also adding some fairly priced non-stop option from Rome with Alitalia however there is very low availability..
Air France-KLM offer the cheapest flights when departing from Italy to Argentina from March till end of June 2019. Max stay 3 months. Book this promotion by 5th of February or until sold out..Need affordable hotel in Buenos Aires you can book it through Booking.com or Hotels.com. Travel dates vary by each route, you can easily compare all the cheapest flights directly at website of Air France / KLM. Booking sample of cheap flights from Italy to Buenos Aires, Argentina from €438 return! As per our booking sample above you would fly from Rome to Buenos Aires on Sunday, 5th of May. Return from this amazing South American country back to Italy on Friday, 17th of May 2019. Discount offer is based on service of a SkyTeam airlines Air France-KLM.